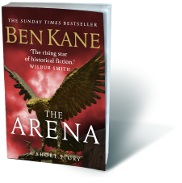 A day out with comrades, brutal gladiator fights, a bet with disastrous consequences. A Roman soldier’s much anticipated payday plays out in very different ways to those he expected. The German frontier, AD 12. Legionary Marcus Piso is set to enjoy a four monthly payday with his comrades. Wine, food and gladiatorial entertainment are on offer, and his purse is full.